Slice eggplant and salt it. Allow it to sit for twenty minutes and towel off any moisture that has risen on the eggplant. 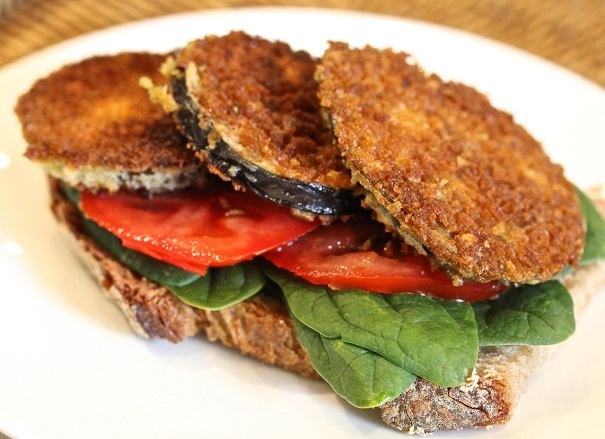 Dip eggplant slices in flour, then egg, then panko. Heat olive oil in a large frying pan to medium heat. Place eggplant into pan and fry until golden brown on each side (about 4 minutes). Place cooked eggplant on paper towels to drain. Toast the bread and slice the tomato. 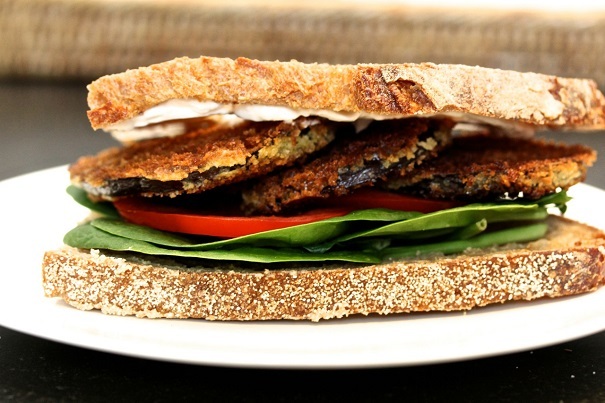 Assemble sandwich: spread vegenaise on bread, then spinach, tomato and eggplant. Top with other piece of bread, cut in half and serve.